Cryptocurrencies have revolutionized the way the world looks at transactions - but they’ve also facilitated some monumental scams over the past nine years. The success of Bitcoin and a number of altcoins jumpstarted an industry that is incorporating Blockchain technology in a number of innovative ways. Since Bitcoin’s inception in 2009, people have become increasingly enamoured with the idea of Blockchain technology. Over time, developers and business minds began creating their own solutions with this decentralized ledger technology. This led to the development of Ethereum and other virtual currencies, with the former in part responsible for a boom in initial coin offerings (ICO) in 2017. As an ICO is essentially a round of public finding and is typically launched by a tech startup which sells inhouse cryptocurrency tokens to prospective investors, these investors buy tokens in the hopes that company will launch its product and the tokens will grow in value. An ICO is not unlike an initial public offering, which is when a traditional company makes its share available for purchase to the general public. In fact, this is where the ICO moniker stems from. Given that there are no promises that an ICO will make good on its future plans, investors take a leap of faith when they part ways with their money. This of course has led to a plethora of scams billed as ICOs, which have seen thousands of investors left out of pocket. 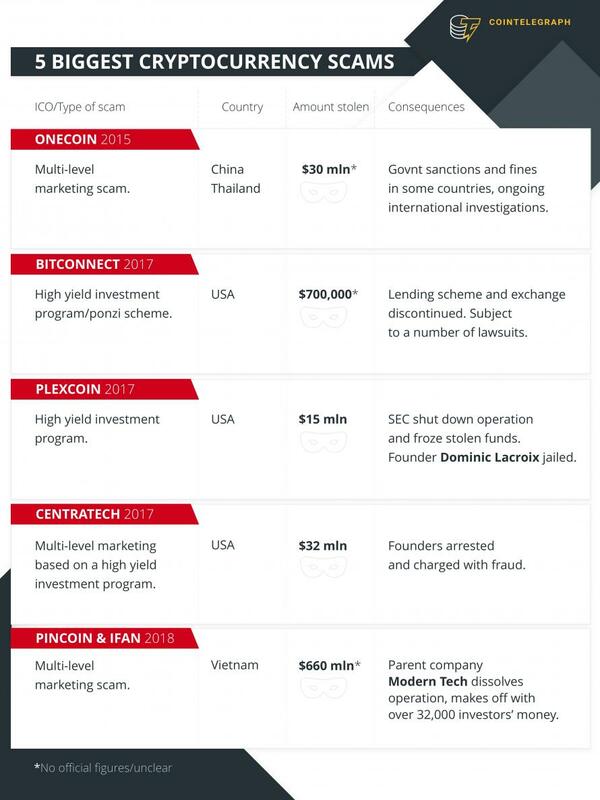 Here are five of the biggest ICO scams in history. The most recent large-scale ICO scam grabbed headlines in April. Two ICOs, run by the same company operating out of Vietnam, are believed to have swindled around 32,000 investors of a combined $660 mln. The company in question, Modern Tech, packed up its offices in Ho Chi Minh city last month, making off with investors money. The scam is believed to be the biggest in ICO history. A number of investors protested outside the vacant offices in the city on April 8, after the company refused to process cash withdrawals. The city’s administration has ordered police to investigate the fraud. Both ICOs have been classified as multi-level marketing scams. iFan was advertised a social media platform for celebrities to promote their content to fans. Meanwhile Pincoin was promising 40 percent monthly returns on investments made. The project claimed to be building an online platform encompassing an ad network, auction and investment portal and peer-to-peer marketplace built on Blockchain technology. OneCoin has been the subject of a number of investigations over the past 18 months. Officially labelled as a ‘clear ponzi scheme’ in India in July 2017, it was fined €2.5 mln by Italian authorities two months later. 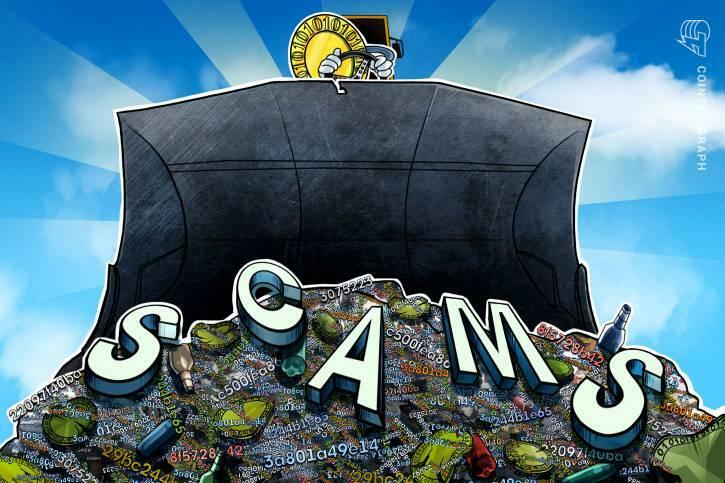 Cointelegraph has previously warned readers to stay clear of the operation, as OneCoin does not even operate a legitimate decentralized cryptocurrency. Furthermore it does not have a public ledger and its Bulgarian offices were raided in January with servers seized by authorities as international investigations and court cases continue against the company. Scandals in countries around the world summed up the fact that OneCoin is indeed a massive scam. In 2016, over $30 mln dollars were seized by Chinese authorities investigating the OneCoin operation in the country. The company claimed to be officially licensed in Vietnam last year as well, but this was later refuted by the country’s government. More than five countries have warned investors of the risks involved for those choosing to invest in the company, including Thailand, Croatia, Bulgaria, Finland and Norway. Long accused of being a ponzi scheme, Bitconnect discontinued operations in January in the wake of a cease and desist order from two American financial regulators. Users exchanged Bitcoin for Bitconnect Coin (BCC) on the Bitconnect platform, launched in Jan. 2017, and were promised astronomical returns on their investments. Furthermore the company ran a lending program, where users lent BCC out to other users to make interest depending on how much BCC they’d lent on the platform. There was also a typical, ponzi scheme referral system. Nevertheless, the wider cryptocurrency was hardly sympathetic when the operation shut down its lending scheme and exchange platform. A number of users have since launched a class action lawsuit against Bitconnect to recoup lost funds - amounting to $700,000 for their particular claim. This particular ICO was nipped in the bud in Dec. 2017 after being labelled a typical return on investment ponzi scheme. Plexcorp was promising investors over 1300 percent return on investment per month before the US Securities and Exchange Commission (SEC) ordered the company to stop operations. Over $15 mln had been raised during the Plexcoin ICO. Luckily all of the funds were frozen by the SEC and founder Dominic Lacroix was jailed. Interestingly, it was the first time the SEC stepped in and charged an ICO through its Cyber Crime Unit. Plexcoin’s offerings was also classed as a security, hence the SEC’s decision to press charges. Having been endorsed by the likes of superstar boxer Floyd Mayweather and DJ Khaled, Centratech was thrust into the spotlight for its supposed Visa and MasterCard debit card service that would allow users to convert cryptocurrencies to fiat. Two of the founders have since been arrested on fraud charges relating to the ICO, which raised around $32 mln, according to Ars Technica. The SEC highlighted the extreme lengths the founders, Sohrab “Sam” Sharma and Robert Farkas, went to in order to dupe investors. The US regulator is looking to seek permanent injunctions, and intends to force Sharma and Farkas to return stolen funds with interest. The pair will also be barred from serving as company officers or directors, and be banned from participating in any securities offerings. As these five scams show, fraudsters will go to extraordinary lengths to swindle unsuspecting investors. It highlights a need for investors to do their due diligence when it comes to investment decisions. Cointelegraph reached out to American investor and founder of Skill Incubator Chris Dunn for comment on the Pincoin and iFan debacle.Overall, Dunn believes that the cryptocurrency community needs to become more discerning towards new ICOs. If not, governments around the world are likely to take sterner stances towards cryptocurrencies in general. Sadly, scams like these are a blemish for cryptocurrencies in general. While they operate in isolation, the fact that they ride on the cryptocurrency wave smears the wider community, which is driving innovation in a number of spaces. It provides a focus point for skeptics to attack cryptocurrencies, when in fact these scams are anything but legitimate ICOs and cryptocurrencies. What the greater public and authorities need to avoid is assuming that ICOs are all cut from the same cloth. Undoubtedly, there are criminals looking to take advantage of the hype of a new technology. However that does not take away from the sterling work of some of the brightest minds in the IT industry.